Closed canopy perennial stream in Sonoma county, CA. Goal: Develop and apply a general approach for stream habitat characterization, management, and restoration, in particular with respect to temperature regimes required by species of conservation concern. Background: Temperature is a fundamental determinate of habitat suitability for aquatic organisms. Water temperature is determined by a complex interplay of prevailing meteorology, local riparian canopy structure and solar exposure, streambed morphology, and surface and subsurface flow patterns. We have developed a methodology for spatial-temporal analysis of stream temperature regimes. Our approach synthesizes long-term records of stream flow and water temperature, meteorology, stream morphology, observed temperature regimes, riparian canopy structure and solar exposure, prediction of temperature regimes, and characterization of species requirements. 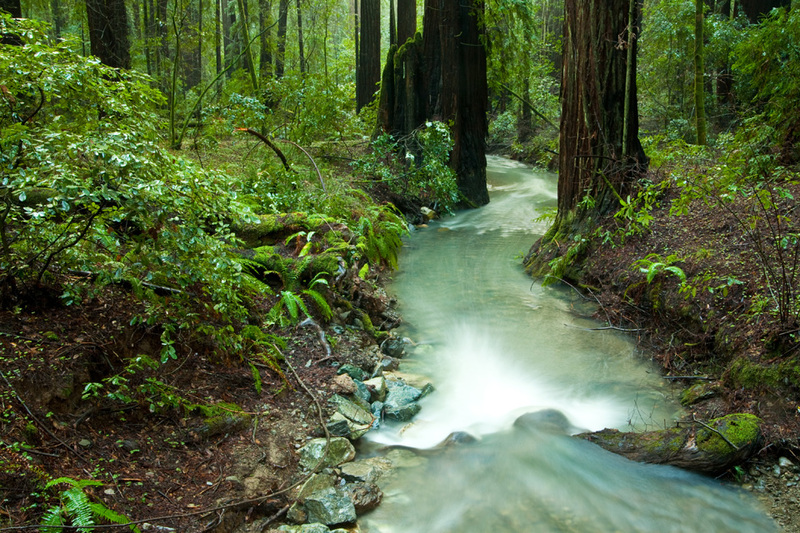 This approach can be applied to a broad spectrum of streams for habitat assessment, stream conservation, restoration to accommodate diverse habitat needs, and examination of potential impacts of climate change. Planning and Review: plan site-specific adaptive management of stream habitat, with periodic review of success and reassessment of goals; facilitate communication/collaboration among stakeholders (scientists, public, resource managers, and decision makers). 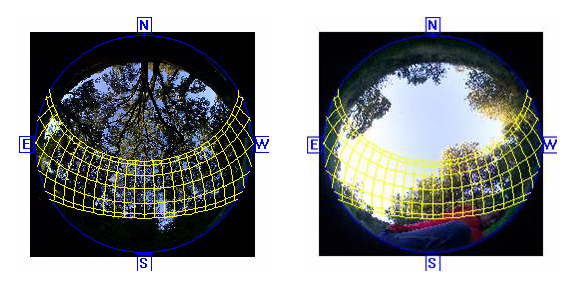 Upward looking hemispherical (fisheye) photograph from a closed canopy (left) and open canopy reach (right) of San Francisquito Creek (San Francisco Peninsula, California). Stream Habitat Characterization: We employ hemispherical photography, stream morphology, and meteorological sensors, together with biophysical models of energy balance and temperature to engineer best management strategies. This comprehensive approach enables us to identify, maintain, and restore riparian canopy structure that provides suitable microsites, with respect to solar exposure and temperature. Daily temperature for closed versus open canopy reaches of San Francisquito Creek. 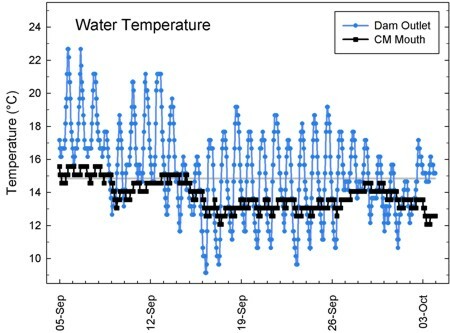 Initial Findings for San Francisquito Creek: Water temperature co-varies with air temperature, diurnally with a lag, and over longer periods; stream reaches with high solar exposure display higher temperature variability (up to 5° C differential from baseline), whereas shaded reaches display modest temperature variability (0.5 – 1.0° C differential); and subsurface flow through gravel beds can decrease temperature by 2 – 3° C. Steelhead (Oncorhynchus mykiss) requires relatively cool microsites, whereas California red-legged frog (Rana aurora draytonii) and western pond turtle (Clemmys marmorata) require warmer microsites. Comprehensive Solutions: Our approach merges basic science, advanced technology, and adaptive management to restore and conserve stream habitat.